"Ever wish your boss was dead?" Horrible Bosses tells the tale of three men who are fed up with the ways they are being treated at work, and decide to take matters in their own hands. Jason Bateman plays the role of Nick Hendricks, who is at the mercy of his boss Dave Harken, played by Kevin Spacey. Even after coming in and working until the late hours of the night, he is reprimanded for being only a minute late to clock in. After having a promised promotion stolen from him without justifiable cause, he still finds himself locked into having to remain at his original position. Dale Arbus, played by Charlie Day, is a dental assistant under the watch from his boss Dr. Julia Harris, D.D.S., played by Jennifer Aniston. Her sexual advances upon Dale continue no matter what he says or does, seemingly without end. Even though she is told repeatedly that he is engaged and to cease, she persists until he comes to a breaking point. Although he will not give in, he will join Dave in his hatred of his own boss. The two are joined by Kurt Buckman, played by Jason Sudeikis. Even though he loved his boss, he died and left the company to his evil, coked out son. Each of the three men find an idea thanks to a gentleman in the bar, who teaches them how to get away with their murder, without losing their jobs. Their plans do not work out as they intended, once finding out one of the bosses has murdered one of their other targets themselves, leaving them to be questioned by the police. Now they will have to prove their innocence while also proving the guilt of Harken in the murder of the new company owner, played by Colin Farrell. Horrible Bosses is a film that can be appreciated by just about any viewer within the workforce. Horrible Bosses is currently available to watch and stream, download, buy on demand at TNT, Amazon, Vudu, Google Play, FandangoNow, iTunes, YouTube VOD online. Jennifer Aniston Shuns Her Dying Mother? Jennifer Aniston hasn't visited her estranged mother, hospitalized for a stroke, and Nancy Dow's heart is reportedly "breaking." The new trailer for "Horrible Bosses" has come online, and it looks just as delightful as I'd guessed. Jason Sudeikis, Jason Bateman, and Charlie Day star in it, and if that isn't a deadly combination, I don't know what is. 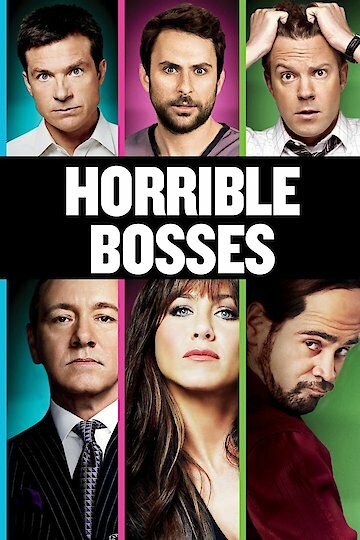 Watch the trailer for "Horrible Bosses" here. Hey, after years of dogging her with pregnancy rumors, we were all pretty much asking for Jennifer Aniston to take the piss out of us. The "Friends" icon does just that with a new Smartwater video that reveals that we weren't ENTIRELY wrong....just too dim to pick up on the truth. Well-played, Rachel. You ever wish you could make your boss go away forever? If so, then this summer's comedy "Horrible Bosses" will be a must-see for you. The film, directed by Seth Gordon, stars Jason Bateman, Charlie Day and Jason Sudeikis as three disgruntled employees who plot to kill their bosses. Their bosses are played by Kevin Spacey, Jennifer Aniston and Colin Farrell respectively.